Steaming is a simple way to cook vegetables, and it leaves the flavor intact. 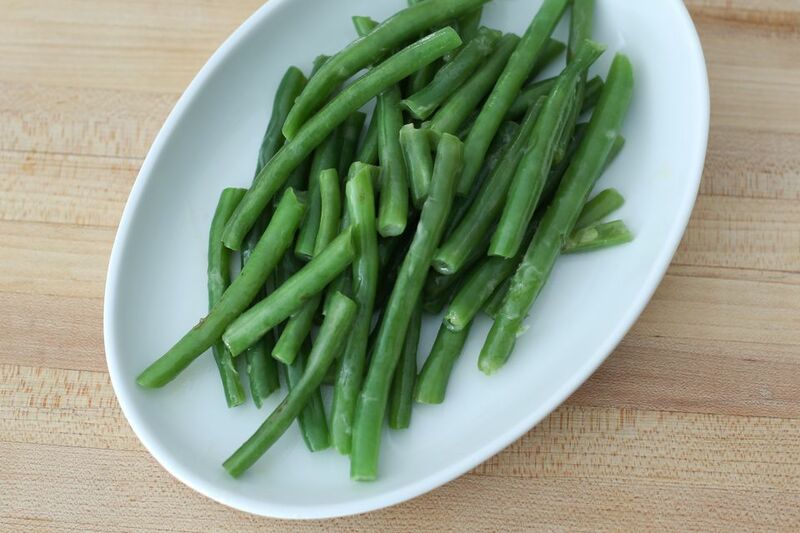 These steamed green beans are still bright green and have plenty of fresh flavors. What's the best thing about streaming vegetables, you wonder? They require little time and attention. Not to mention the fact that fewer nutrients end up in the water. Wash the green beans and trim the stem ends. Leave them whole or cut. Set a steamer basket in a medium to a large saucepan filled with 2 inches of water. Put the green beans in the steamer basket. Bring to a boil over high heat. Reduce heat to medium, cover, and steam the green beans for 5 to 7 minutes, depending on how tender or crisp you like them. Discard the water in the saucepan. Add the butter and the steamed green beans and heat just until hot and butter has melted. Sprinkle with salt and freshly ground black pepper, to taste. Beurre Maître d'Hôtel: Combine 1/2 cup butter with 1 tablespoon minced parsley and 1 teaspoon fresh lemon juice. Add fine sea salt and freshly ground black pepper to taste. Basil Butter: Use about 1/2 cup chopped fresh basil leaves for every 1/2 cup butter. Add a clove of minced garlic, if you like, and/or a grating or two of lemon zest as well as fine sea salt to taste. Cilantro Lime Butter: For each 1/2 cup of butter, use 2 or 3 tablespoons chopped cilantro leaves, and 2 teaspoons lime zest. Add a bit of green chile sauce (or green Tabasco) if you're so inclined. Lemon-y Butter: Combine 1/2 cup butter with 1 teaspoon fresh lemon juiceand 1 tablespoon freshly grated lemon zest(just the yellow part of the peel, being sure to avoid the bitter white pith beneath when you grate). Have You Ever Tried Creamy Lima Beans?